Glycolytic oscillations in yeast cells of the species Saccharomyces cerevisiae is a well-studied phenomenon. This example simulates the oscillations near a so-called Hopf bifurcation. Changing a parameter slightly around the bifurcation point qualitatively changes the behavior of the system. Easily import the model in the Systems Biology Markup Language (SBML) format. Compare how small changes in the bifurcation parameter affect the oscillations of protein and molecule concentrations. 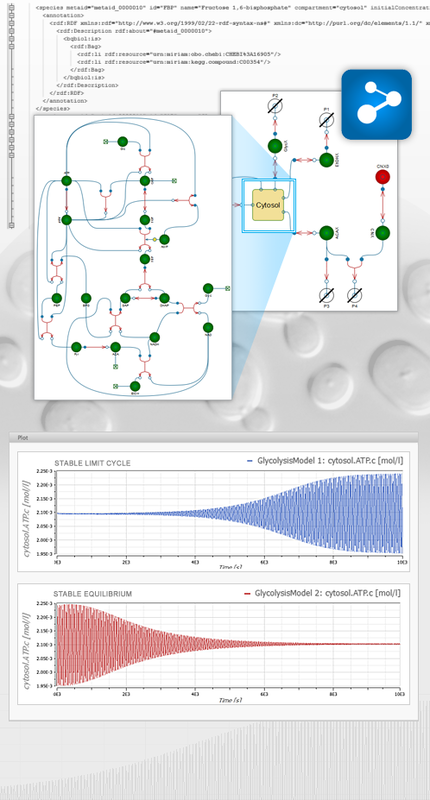 Use the built-in BioChem library to visualize and simulate the model. Hynne et al., 2001. Full-scale model of glycolysis in Saccharomyces cerevisiae.